The quality of human nutrition is getting more and more into focus in the recent years. For either environmental or ethic reasons as well as individual health concerns an increasing number of people is switching from meat and fish based diets to a vegetarian or vegan lifestyle. A critical point related to a vegetarian or vegan lifestyle is sufficient supply of essential nutrients, of which some are highly abundant in animal products. Omega-3 fatty acids are examples for such nutrients considered essential fatty acids for humans. That means they cannot be synthesized in the human body and instead have to be taken up with the diet. Fatty acids have two ends: the carboxylic end (-COOH) which is considered the beginning of the chain (thus this end is also named the alpha end) and the methyl end (-CH3) which is considered the tail of the chain (thus omega). Omega-3 fatty acids are polyunsaturated fatty acids with a double bond at the third last carbon atom of the carbon chain and they can be distinguished based on the number of double bonds. For example, α-linolenic acid (ALA; Fig.1) has three double bonds and can be found in seeds (e.g. chia or flaxseed), nuts (e.g. walnuts) and vegetable oils (e.g. rapeseed or soybean oil). The most active omega-3 fatty acids in the human body are eicosapentanoic acid (EPA) (C20-5n-3) and docosahexanoic acid (DHA) (C22-6n-3) (s. Fig. 2a & 2b). In contrast to ALA, those acids contain five and six double bonds, respectively. They cannot be found in plant sources, but are highly abundant in fed-rich cold water fishes (like herring, mackerel, salmon, sardine or tuna fish). ALA can function as a precursor for the synthesis of EPA and DHA in the human body, in which they serve many purposes, e.g. play a crucial role in structure and function of cellular membranes and are precursors to several important eicosapentanoids, including prostacyclins, leukotriens and prostaglandins. They ameliorate a number of human diseases, including coronary heart disease, autoimmune and inflammatory disorders, diabetes, obesity and cancer (Deckelbaum et al. 2012; Funk 2001; Ma et al. 2004). In addition to their use as health supplements, EPA and DHA are also used in pharmaceutical, aquaculture, terrestrial animal feed, pet food and personal care. The demand for EPA and DHA is growing, but most commercially available EPA and DHA are produced using wild-caught ocean fish. A land-based (animal-free) production of EPA and DHA using a variety of organisms ranging from algae to plants has been investigated as a sustainable alternative to production from fish. DHA has been commercially produced from microalgae such as Crypthecodinium cohnii and Schizochytrium sp., but so far, attempts to produce EPA have not generated satisfactory yields (Barclay et al. 1994; Barclay et al. 2005). Genetic engineering of Saccharomyces cerevisiae for EPA production yielded less than 1% of the total fatty acids (TFA) as EPA (Tavares et al. 2011). Transgenic plants have been reported to produce EPA at about 3% of the TFA in Arabidopsis leaves and at about 25% of the TFA in Brassica seeds (Cheng et al. 2010; Napier et al. 2005). An economically feasible production of EPA from transgenic plants has not yet been achieved. Because of that, the study of Xue et al. 2013 represents a milestone in the production of the essential fatty acid EPA independent of any animal source. They engineered the nonconventional, fed-rich yeast Yarrowia lipolytica to provide a commercially viable, sustainable, land-based source of EPA and other valuable long-chain polyunsaturated fatty acids (LCPUFA). Y. lipolytica can naturally synthesize linoleic acid (C18:2n-6) (Fig. 3, grey box). To achieve the synthesis of EPA based from linoleic acid, the introduction of a Δ-9 elongase, a Δ-8 desaturase, a Δ-5-desaturase and a Δ-17-desaturase into Y. lipolytica is necessary (Fig.3, yellow box). Xue et al. 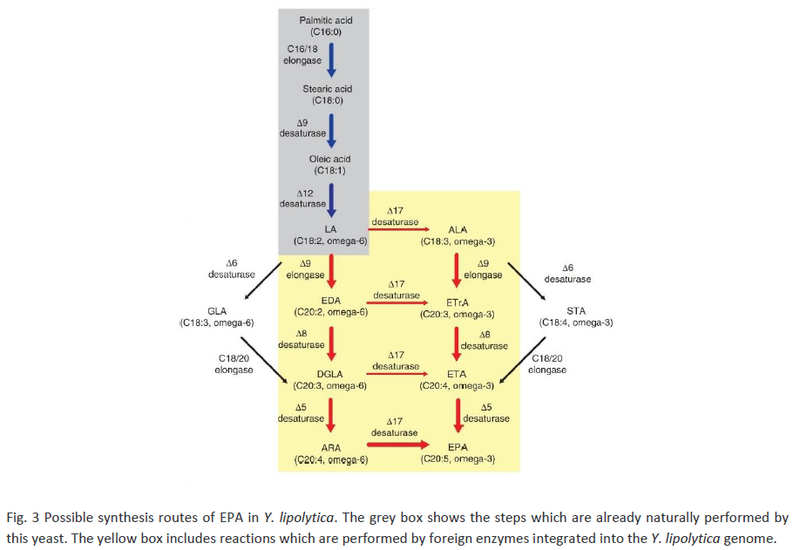 2013 identified suitable enzymes from algae, euglenoids and fungi which could enable the synthesis of EPA. In a stepwise process, they integrated one copy each of a heterologous Δ-9 elongase, a heterologous Δ-5 desaturase and a heterologous C16/18 elongase, and additionally several copies each of a heterologous Δ-12 desaturase, a heterologous Δ-9 elongase, a synthetic mutant gene coding for a Δ-8 desaturase, a heterologous Δ-5 desaturase, a heterologous Δ-17 desaturase and the intrinsic cholinephosphotransferase gene (CPT1) into the genome of Y. lipolytica by nonhomologous end joining. The addition of CPT1 has been shown to increase the denaturation of fatty acids in Y. lipolytica in previous experiments. 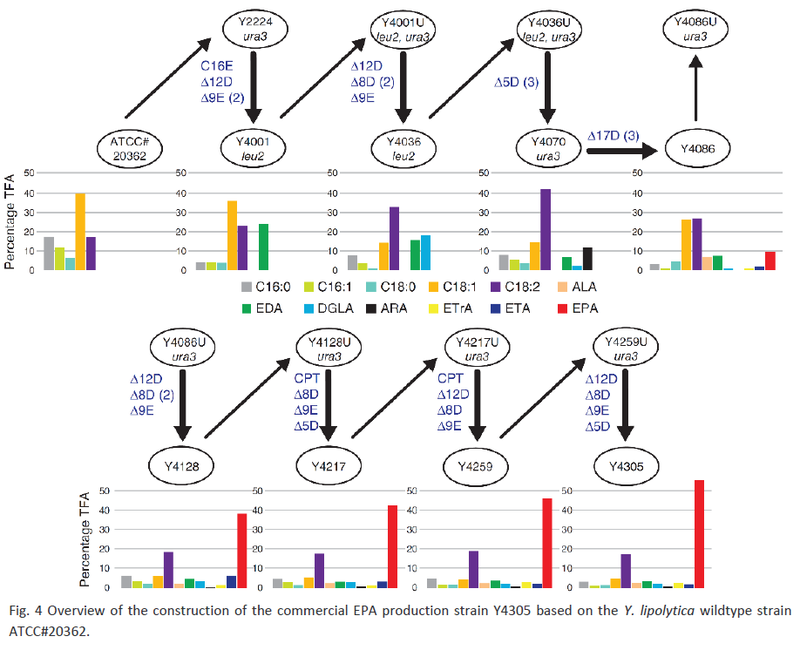 Figure 4 shows the stepwise introduction of the mentioned genes and the resulting EPA titers in the strains. One intermediate transformant (Y4128) showed an extraordinary high EPA titer of 38% instead of an averagely measured 16% for other transformants. Genome walking (from the border sequences of the integration cassette of the plasmid pZP2-2988) revealed that the plasmid had inserted itself into the coding region of the PEX10 gene, resulting in the truncation of the C-terminal 32 amino acids that form part of the PEX10 RING motif. PEX10 is coding for a peroxisome assembly protein which is involved in the import of peroxisomal matrix proteins and is required for normal peroxisome proliferation in Y. lipolytica (Prestele et al. 2010). Peroxisomes are the place in the cell where degradation of fatty acyl-CoAs (β-oxidation) occurs. Growth studies showed that strain Y4128 could no longer use oleic acid (oleate; C18: 1n-9) as sole carbon source which indicates an impaired β-oxidation. This observation was confirmed by transformation of the strain with a plasmid carrying the intact, wildtype PEX10 gene which restored a normal growth on medium supplied with oleate and reduced the EPA titer to about 13% of the total fatty acids (TFA). Strain Y4128 was used to construct the final commercial EPA production strain Y4305. This strain had an EPA content of 15% of the cell dry weight and produces lipids with EPA at 56.6% of the TFA. Production of EPA by Y. lipolytica is patented in the US patent US 7932077 B2. Before this study was performed, a natural or engineered EPA-producing organism that could achieve a productivity that fulfills commercial demand was not known. This study shows that Y. lipolytica, as oleaginous yeast, is an excellent host for omega-3 fatty acid production. It is an organism used to a high level of lipids and suitable to redirect its metabolism towards a high EPA production through expression of a range of homologous and heterologous enzymes. Barclay WR, Meager KM, Abril JR. 1994. Heterotrophic production of long chain omega-3 fatty acids utilizing algae and algae-like microorganisms. J Appl Phycol 6:123–129. Barclay WR, Weaver C, Metz J. 2005. Development of a docosahexaenoic acid production technology using Schizochytrium: a historical perspective. Single Cell Oils 36–52. Cheng B, Wu G, Vrinten P, Falk K, Bauer J, Qiu X. 2010. Towards the production of high levels of eicosapentaenoic acid in transgenic plants: The effects of different host species, genes and promoters. Transgenic Res 19:221–229. Deckelbaum RJ, Torrejon C. 2012. The omega-3 fatty acid nutritional landscape: health benefits and sources. J Nutr 142:587S–591S. Funk CD. 2001. Prostaglandins and leukotrienes: advances in eicosanoid biology. Science 294:1871–1875. Ma DWL, Seo J, Switzer KC, Fan Y, Mcmurray DN, Lupton JR, Chapkin RS. 2004. n-3 PUFA and membrane microdomains : a new frontier in bioactive lipid research. J. Nutr. Biochem. 15:700–706. Napier J a, Sayanova O. 2005. The production of very-long-chain PUFA biosynthesis in transgenic plants: towards a sustainable source of fish oils. Proc Nutr Soc 64:387–393. Prestele J, Hierl G, Scherling C, Hetkamp S, Schwechheimer C, Isono E, Weckwerth W, Wanner G, Gietl C. 2010. Different functions of the C3HC4 zinc RING finger peroxins PEX10, PEX2, and PEX12 in peroxisome formation and matrix protein import. Proc Natl Acad Sci USA 107:14915–14920. Tavares S, Grotkjær T, Obsen T, Haslam RP, Napier J a, Gunnarsson N. 2011. Metabolic engineering of Saccharomyces cerevisiae for production of eicosapentaenoic Acid, using a novel Δ5-desaturase from Paramecium tetraurelia. Appl Environ Microbiol 77:1854–1861. Xue Z, Sharpe PL, Hong S-P, Yadav NS, Xie D, Short DR, Damude HG, Rupert R a, Seip JE, Wang J, Pollak DW, Bostick MW, Bosak MD, Macool DJ, Hollerbach DH, Zhang H, Arcilla DM, Bledsoe S a, Croker K, McCord EF, Tyreus BD, Jackson EN, Zhu Q. 2013. Production of omega-3 eicosapentaenoic acid by metabolic engineering of Yarrowia lipolytica. Nat Biotechnol 31:734–40.